I have created this post in part as a type of public service announcement. October 5th, Monday is the last day to update or register electronically to vote at myvote.wa.gov. Washington has a somewhat unique and perhaps uniquely convenient solution to voter registration and voting: all electronic registration coupled with vote by mail ballots. If you want to vote in the primary election in Whatcom County (or any other WA County) you must have a registration in good standing. You can check this at myvote.wa.gov and it is an excellent idea to do so whether you have moved or not. Every week voters are removed and added to the Washington voter rolls by your local election office. Every quarter this process is specifically repeated in coordination with a PEW States initiative in Olympia called ERIC[1,2,3,4,5,6]. There are three status code for any voter on Washington voter rolls: (A) "Active", (I) "Inactive", (C) "Cancelled". The status you want is (A) "Active". If you move and a ballot is returned "undeliverable", the election office will make some attempt with the information they have to contact you. If they can't find you (hey, you moved! ), then onto the (I) "Inactive" list you go. If you miss a couple of elections without voting (for example), then onto the (C) "Cancelled" list you go. If you have just moved, you can solve this problem by logging into myvote.wa.gov and updating your address. This will re-activate your voting status to (A) "Active". There are a number of other reasons why your status could end up (I) "Inactive" or (C) "Cancelled", but for most, the path to (I) or (C) is moving and not remembering to update myvote.wa.gov. 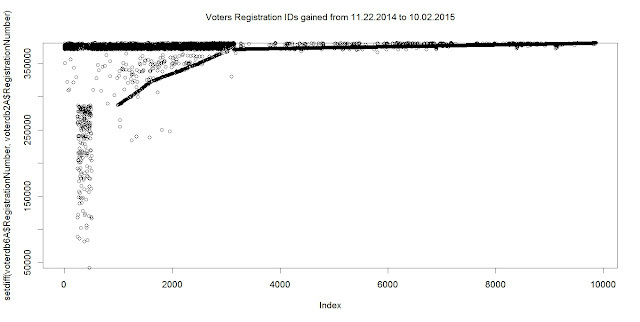 The path back to (A) "Active" is to logon to myvote.wa.gov and update your registration to your correct address. If you have any problems at all with this process in Whatcom County, please call the Elections Office. 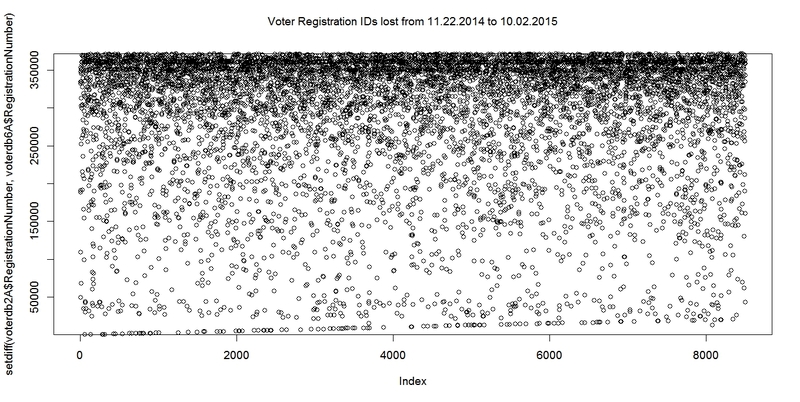 ## Intersection from one point of origin - voters lost. e.g. 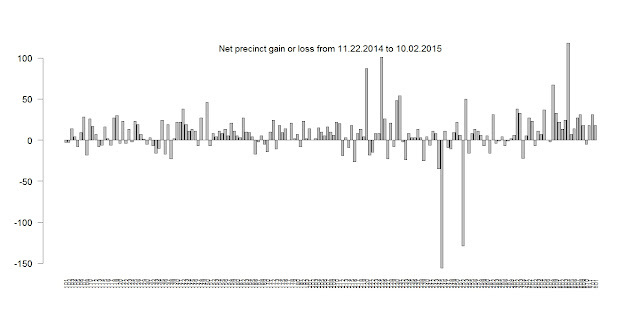 intersect(x,y) = "In x and in y"
## setdiff from one point of origin - voters lost. e.g. setdiff(x,y) = "In x not in y"
## setdiff from points of origin - voters gained . e.g. setdiff(y,x) = "In y not in x"
## setdiff from consecutive points of origin - voters lost each period. e.g. 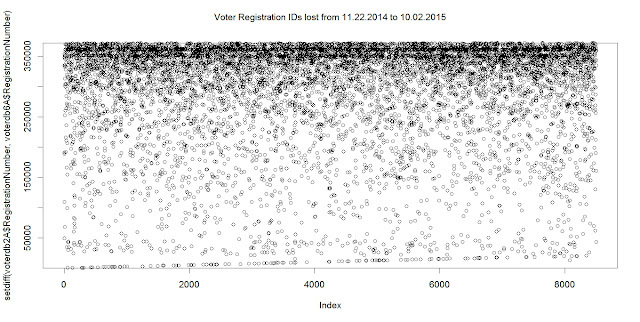 setdiff(x,y) = "In x not in y"
## setdiff from an arbitray point of origin showing significant voters lost between these periods. ## e.g. setdiff(x,y) = "In x not in y"